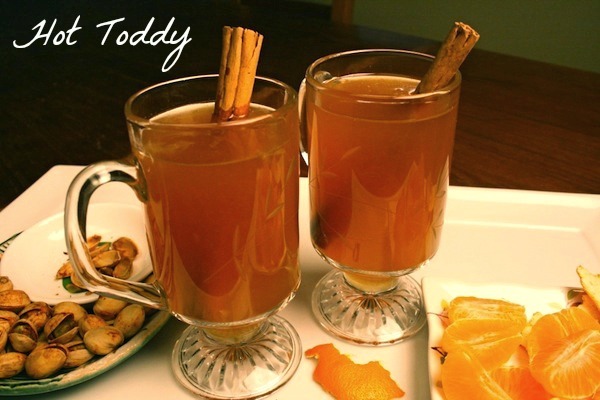 Hot Toddy – The Perfect Nightcap. Every so often the evening is in order for a nightcap. Something that will fray the tension of the day to the sidelines and bring sleep to a cozy snuggle. I happen to favor the Hot Toddy. I remember exactly where I was the first time I had the beverage… Boston Summer 2002. I had a nasty cold and an Irish family friend of mine suggested a Hot Toddy, reassuring me I would like the taste and it would help me sleep through the night. Hot Toddy turned out to be so right…It’s such a GREAT drink. 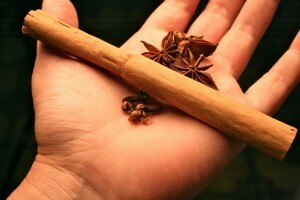 In a small sauce pan over medium flame add cinnamon stick, cloves, anise star, and water. Bring to a boil and let simmer for 10 minutes. In two glasses divide the the remaining ingredients. Start with 1 1/2 tablespoons of honey in each glass. 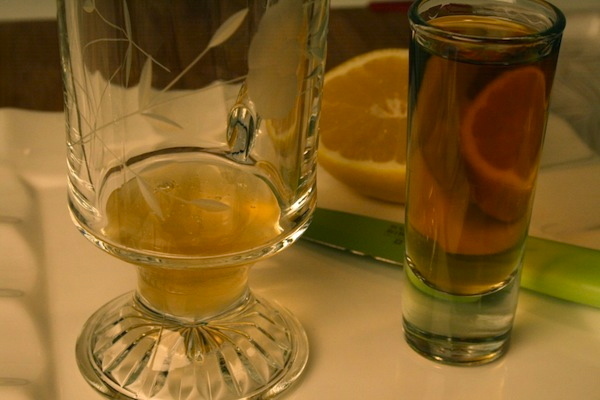 Then squeeze half a lemon in each glass, and pour 2 ounces of whiskey in each glass. Give it a good swirl and top the honey lemon whiskey mixture with hot cinnamon tea. swirl again and enjoy hot. I serve with chili lime pistachios and pieces of tangerine for a superb accompaniment! Sleep tight. Easy to make Buñuelos for a touch of a Mexican Christmas! Pappardelle Pasta in Cheese Sauce with Ham, Mushrooms, and Peas. Awesome ingredients! It looks very inviting! Wow! That drinks looks super cozy. I bet it smells great too. I need this right now. I’ve been so friggin’ sick I can hardly stand to be me. I could drink this every day, all day. So good. And smells great. Happy new year! This looks great and must smell fantastic! The perfect remedy for those cold winter nights when you’re feeling sick. 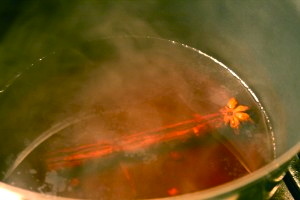 This looks so comforting; I am a tea, hot cider and all about comforting drinks. I am definitely trying this one! Thank you! It sounds amazing! I’ve never heard of it but I’ll definitely give it a try. mmm .. sounds great…I need to try! I can smell the cinnamom! This is perfect for a cold winter evening. I bet this warm drink made your house smell glorious as you prepared it. I once had the worst cold while living in Barcelona. My friend was visiting and dying to go clubbing, so I just drank hot toddies before going out and not only had a blast, but actually felt better after. On top of that, they were delicious! I’ll have to try this out, especially with this cold weather. Burr! Also, to kick it up a notch, 101 proof Wild Turkey, and Sichuan peppercorn. It f’d up everyone at the Christmas party.